Usually, when a dog vomits, it is simply because it has eaten more than its tiny stomach can digest. However, in some cases, vomiting can be a sign that something serious is happening to your furry friend, which requires rapid medical assistance. So how can you know what it means when your pup pukes a yellow bile? If your dog has an intestinal blockage, naturally, it will keep throwing up because no food can get past this obstruction. Therefore, everything it eats will come back up. 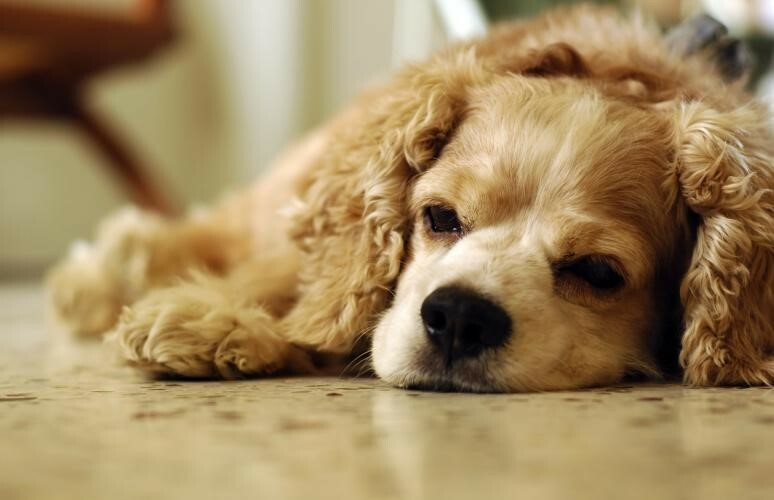 In addition to vomiting frequently, the affected dog could also lose appetite, experience abdominal pain, as well as become constipated or dehydrated. Your doggie will most likely need to undergo surgery so that the obstructing item can be removed. Secondary problems such as dehydration are resolved in a veterinarian’s office too, in this particular case with the administration of IV fluids. Early diagnosis of this condition is essential, as the sooner it is treated, the better it is. Pancreatitis, the condition of the inflamed pancreas, could be why your dog throws up yellow bile. It develops once your dog ingests a meal that is high in fat, for example, bacon. Symptoms are noticeable 24 to 72 hours after the consumption of a greasy meal, and they include frequent vomiting, abdominal pain, and sometimes even fever. Dogs affected by pancreatitis oftentimes need to adapt to a new diet and take several doses of antibiotics. The inflamed pancreas is treated with the help of a fluid therapy, colloids which are drugs responsible for moving the blood flow, and supplements rich in electrolytes. If your animal friend keeps on vomiting, the veterinarian might prescribe a drug to control it. Also, if it is dealing with a lot of pain, the veterinarian might give some pain killers. An irritation of your dog's intestines could very well be one of the triggers of the irritable bowel disease, which more often than not, leads to vomiting. Your veterinarian will introduce you to a special intestinal diet. This diet that contains all nutrients your buddy needs but lacks additives is adapted for each dog, based on which foods agree with it, and which do not. If your pet's immune response is overactive, the veterinarian will prescribe corticosteroids as a way to suppress it. If your dog is dealing with an infection, the veterinarian will prescribe an antibiotic. In this particular case, the dog starts throwing up as a result of the stomach being empty for a while. An empty stomach secretes digestive acids and bile. If it was full, food would absorb these secretions, but as there isn't any food inside of the stomach, digestive acids start irritating its walls. Soon after, the dog starts feeling nauseous and the cycle of vomiting begins. The cycle usually begins during the nighttime when the dog's stomach remains empty for more than 8 hours. It occurs in dogs who are fed only once a day as well, leaving them hungry throughout the majority of it. The treatment includes the application of antacids such as cimetidine and famotidine. If your dog throws up yellow bile, you might also want to add more meals into its diet, give a morning snack and establish a bedtime for it. Your dog is old or you have a puppy. Your dog vomits often, in particular, more than three times per hour. Your dog has been vomiting for more than a day. The vomiting is violent and projectile in nature. Your dog can't seem to ingest any water. It seems as if your dog is in pain. It seems as if your dog is dehydrated. You notice blood in the vomit. You believe that your dog might have an intestinal blockage or was in contact with toxins. Sticking to the following suggestions could minimize the frequency of vomiting. Stop feeding your furry friend two large meals a day, but rather give it a couple of smaller ones. This will keep its stomach full longer. Do not give your pup dry food, since it expands once it absorbs fluids within the stomach. If the dog keeps eating, this food will only make it more and more bloated as it grows bigger. The bloating further only leads to the secretion of gastric fluids which continue to irritate already irritated gastric walls. With this in mind, always go for wet food as its quantity won't change after the ingestion. Do not give your dog foods that it is allergic to, since that could lead to allergic reactions inside stomach, and thus, also lead to vomiting yellow bile. Feed your buddy in a quiet place where it can enjoy the meal peacefully and not get disturbed. If you want, you can stay right beside and pet it gently. Throwing up yellow bile is a frequent occurrence in dogs. Thankfully, it is easily treated with a couple of diet adjustments, some medication, and love, of course. Unfortunately, sometimes, none of the remedies seem to help your furry friend feel better. In that case, visiting your veterinarian is probably the best idea as he/she is the only one who can establish a diagnosis and explain to you what is really wrong with your little animal.